At JAG Gym our mission is simple: We Do Good Things For Kids! We believe that gymnastics has great benefits for all children. From our smallest gymnasts who are just beginning to walk to those who are college-bound to NCAA Division I schools, we treat every athlete with dignity and respect, providing them with professional coaching in a safe, clean environment. While we provide expert instruction intent on helping our gymnasts become strong athletes, we also are committed to developing their character. We know that life lessons like grit, resilience and persistence are traits that will serve our students far after they perform their final cartwheels. 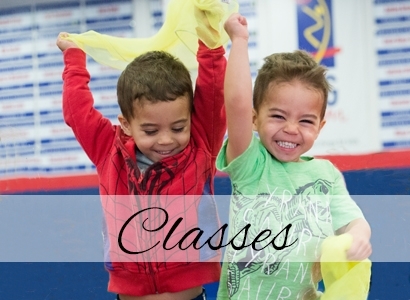 Our class program is designed for children who wish to explore the sport of gymnastics; eventually compete in it; use the skills acquired in another sport, dance, or theater; or simply want to participate because it is fun! Jungle Jym-tastics!™, our preschool-aged program for children pre-walking to pre-Kindergarten, focuses on the development of fine and gross motor skills, playground readiness, social skills, and gymnastics skills, as well as helping to develop proprioceptive and vestibular integrations. Our Academy Students, Kindergarten and above, are placed into class based on skill and gender. JAG’s color-coded curriculum is taught on a continuum, allowing students to move at their own pace, advancing on the events on which they are ready. 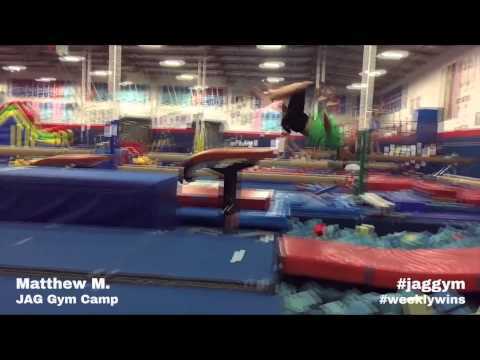 When school is out, JAG Gym Camp is in! 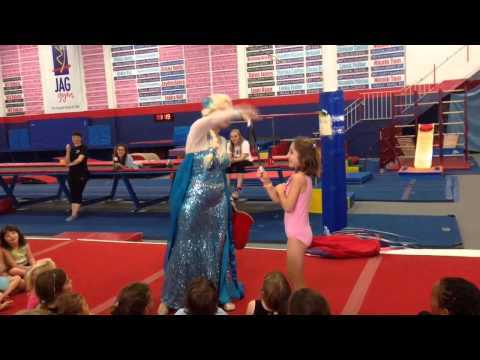 Kids with no gymnastics experience to those with plenty proficiency love JAG Gym Camp. 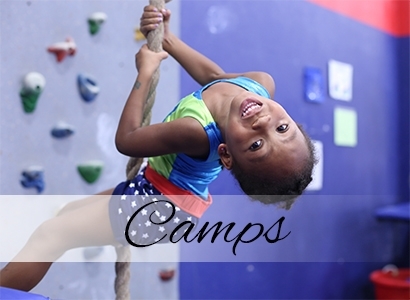 During a camp day, your child will run, bounce, climb, roll and jump their way through our incredible facility. Plenty of gymnastics instruction is mixed with games, inflatables, giant obstacles courses, fun themes and even occasional visits from special guest like puppies. 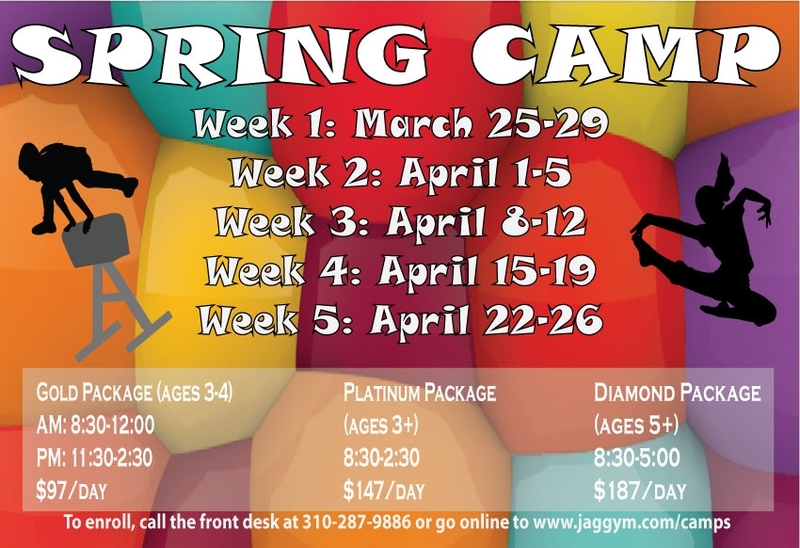 In addition to Winter, Spring and Summer camps, JAG offers a variety of camps for those numerous school holidays. In fact, if you don’t see a camp listed for a day when you don’t have school—call us! With 5 or more students, we are happy to host a camp for you! JAG parties are so easy that all you need is a kid and a cake! While birthdays are our specialty, there is no need to stop there! A JAG party is fantastic to celebrate any occasion and is one that kids and their parents will remember for years. Parties are 90 minutes long, with options to lengthen to accommodate your needs. Additionally there are a slew of other options from bouncers to balloons and princesses to face painters to customize your party into what you and your child have been dreaming about. Best of all, JAG does the work so that you can relax and enjoy your party, your guests and your child’s special day. Welcome to JAG Gym, where we do good things for kids. 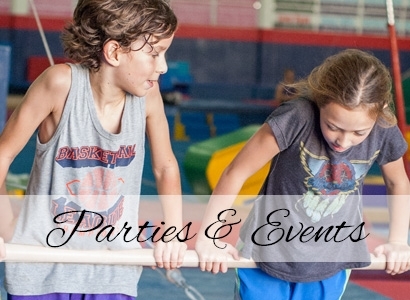 Founded in 2004, we are proud to be Los Angeles’ premier children’s activity center, offering gymnastics classes for children from 6 months through 18 years, as well as competitive gymnastics teams, amazing parties for any occasion, camps, and more. 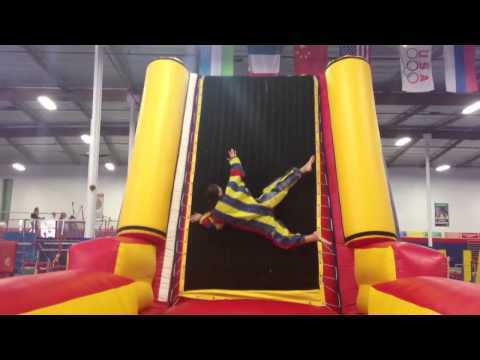 Our clean and bright 25,000-square-foot facility delights both adults and children, filled with top of the line equipment ranging from bars to fit tiny hands to a foam pit for training high level athletes. Open 7 days a week with most classes offered at multiple days and times to fit your scheduling needs, JAG prides itself in family flexible scheduling, including unlimited rescheduling of missed classes. JAG classes are taught by background-screened, safety-certified instructors, all of whom are subjected to rigorous on-going training and recertification of background checks while employed at JAG. 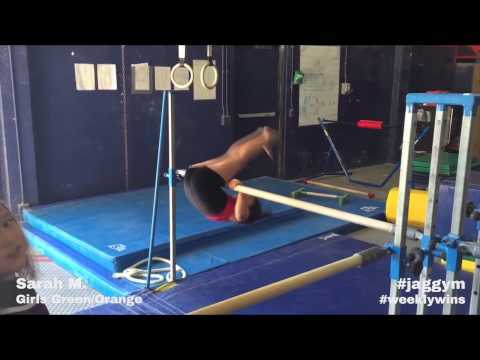 In addition to teaching gymnastics, JAG’s curriculum focuses on playground readiness, general athletic preparation for other sports, and character development. JAG proudly participates in Character Counts!, a character building program based on the 6 pillars of character—Trustworthiness, Respect, Responsibility, Fairness, Caring, and Citizenship. Lessons learned at JAG last much longer than the athlete’s career. 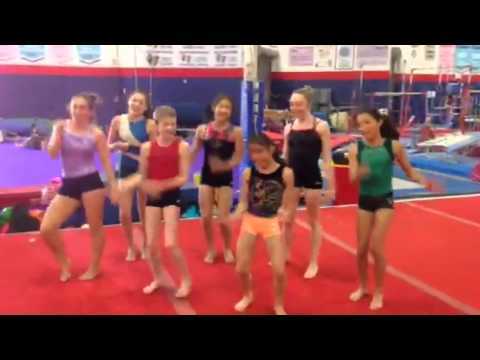 JAG’s class program is designed for children who wish to explore the sport of gymnastics, who wish to eventually compete in it, who wish to use the skills acquired in another sport, dance, or theater, or who simply want to participate because it is fun! To find out which class is right for you, read below and follow the links to the right for more information. 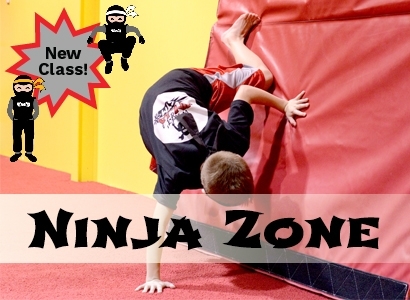 Our class programs are separated into two sections—Jungle Jym-tastics!™ for children pre-walking to pre-Kindergarten and our Academy Program for Kindergarten and up. Classes are on a monthly billing cycle with your commitment being month-to-month. Additionally, because JAG understands how busy our families’ lives are, we are pleased to offer unlimited rescheduled classes for students. Jungle Jym-tastics!™ focuses on the development of fine and gross motor skills, playground readiness, social skills, and gymnastics skills, as well as helping to develop proprioceptive and vestibular integrations. Our Academy Students are placed into class based on skill and gender. JAG’s color-coded curriculum system is taught on a continuum, allowing students to move at their own pace, advancing on the events on which they are ready. While at JAG we believe whole-heartedly that gymnastics is a great sport in which to participate on a non-competitive basis, we also see a great benefit from girls having the opportunity to participate in a team environment if that is of interest to them. Our philosophy at JAG is that ALL children who wish to participate on team will be given an opportunity to train and compete in a group appropriate to their skill level, age and the number of hours that they are willing to train. Several times a year we hold free evaluations to determine the best team placement for those girls interested in joining our team program. Additionally, we are happy to schedule individual appointments for anyone interested in being evaluated for a recommended team placement. Finally, to discuss your daughter transferring from another gym's competitive program to JAG's, please contact our office staff at frontoffice@jaggym.com and a member of our team staff will arrange a time to speak with you. Now enrolling​ for Spring Break Camp March 25 - April 26! 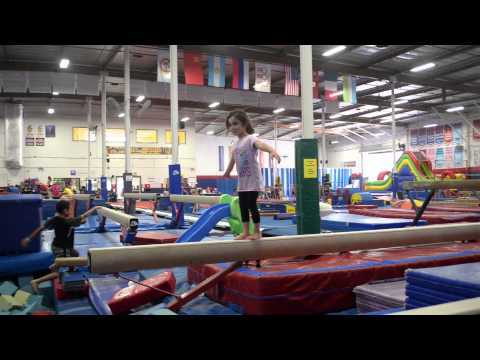 At JAG Gym Camp, your child will spend the day learning gymnastics while bouncing, running, jumping, and climbing their way through our amazing facility. Safety-certified instructors place campers in groups based on age and skill level, ensuring every camper has the most fun and safe experience possible and plenty of opportunities to make friends. Campers ages 3 and 4 spend the day growing their cognitive and playground readiness, motor skills, fitness, and character while learning gymnastics. 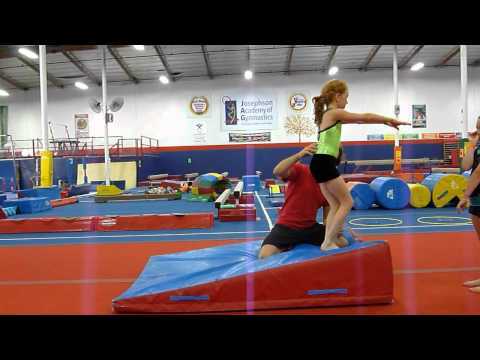 Our older campers (ages 5 and up) will have the opportunity to grow their flexibility, strength, fitness, and character, while learning gymnastics skills on floor, bars, beam, and more. JAG parties are so easy that all you need is a kid and a cake! A JAG party is fantastic to celebrate any occasion and is one that kids and their parents will remember for years. While birthdays are our specialty, there is no need to stop there! JAG hosts holiday parties, school year beginning and ending parties, end of season sports league parties, bar/bat mitzvahs, i-am-going-to-be-a-sibling parties, playgroups, play dates or any kind of party you can dream up! Parties are 90 minutes long, with options to lengthen to accommodate your needs. Additionally there are a slew of other options including bouncers, balloons, face painters, and a personal theme to help customize your party into what you and your child have been dreaming about. Upon booking, one of our friendly office team members will happily go over your options on our customization form to ensure your party reflects your tastes and desires. Best of all, our JAG Party Pros do all the work so that you can relax and enjoy your party, your guests and your child’s special day. As a child, JAG President/Founder Anne Josephson grew up in a gym that taught her far more than gymnastics. Her gym was an extended family and gymnastics was not just a sport but also a tool to teach valuable life skills and lessons. That is what Anne envisioned for JAG when she opened its doors in the fall of 2004: a facility where all would be treated with dignity regardless of ability, where families would find a community of caring professionals working with their children and a gym where kids fell in love with gymnastics and felt valued for who they are, not what they did. Taking her experience as a gymnast, coach, judge, mother of four and a M.S. Ed. In Educational Psychology, Anne brings all of these perspectives together to form the vision that is JAG. Since that opening day, JAG grew from a gym club of three students to one serving over 2000 families per week. While much has changed and grown since JAG’s opening in 2004, one thing remains true: We do good things for kids. Our unique curricula, our accomplished and educated staff, an amazing facility and innovative, progressive and educational sound thinking make JAG unlike any other gymnastics school in the country. We all are truly proud to be a member of the community and family that Anne dreamed of building.